I am guessing that a lot of teams are going to have the pleasure of beating Utah this year, but it still feels good to get a prediction right for a change. I said earlier today that the Bobcats were simply the more talented team, and they showed it on Saturday. 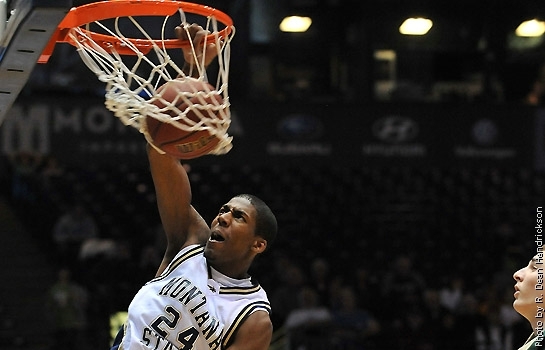 Montana State jumped out to a 9-0 run and never looked back, winning 70-64 in Utah. Rod Singleton led them with 18 points, while Tre Johnson contributed 15 points and 6 rebounds and JUCO big man Mohammed Fall showed he was worth the hype with 12 points and 6 rebounds. The game recap said that the game was tied with just under a minute left when Christian Moon hit a bit 3, which helped jumpstart a 9-3 for the Bobcats which gave them the win. For all of the preseason talk about JUCOs Xavier Johnson-Blount and Jamie Stewart, Moon might be the one that has had the biggest impact. He is a great shooter and is a valuable role player for the Bobcats. The Bobcats improve to 2-1 and own a win over a Pac-12 team. It's a solid start for Brad Huse, who is starting to settle into a bit of a rotation.